Every time I go to eat at a Mexican restaurant, my drink order is always horchata. 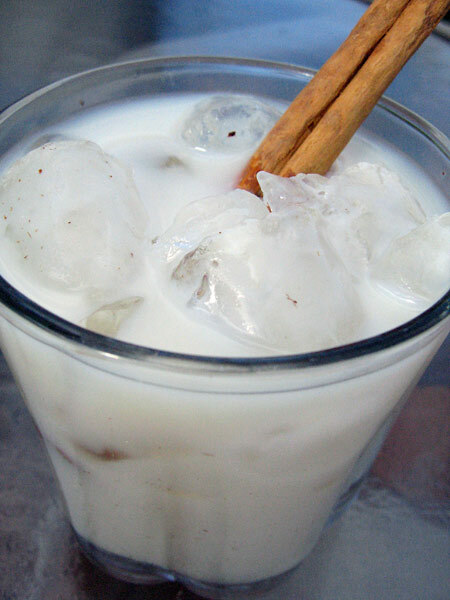 If you have never had horchata, you must try it, either at your local Mexican restaurant (probably need the real deal, not your Americanized Mexican eatery), or better yet, make your own. Not too long back, I found a powder mixture of horchata at my local grocery store, followed the directions by adding water, and trust me, the taste was horrible and it was not horchata! As I recently had tacos al pastor on my mind, I decided to make homemade horchata, and it was not only incredibly easy, but it was spot on. To a bowl, add the rice, cinnamon sticks, and almonds. Fill with water, cover, and let this sit out for at least 6 hours, but overnight is better to soften the rice, and cinnamon, and almonds. The next day, strain the water, and reserve the solids. Add the rice, almonds and cinnamon to a blender. Add in the vanilla, sugar, evaporated milk, and milk. Blend for about 3-5 minutes. You want to break down everything. Next, strain with a fine mesh strainer into a pitcher, mashing down the solids. Discard the solids, reserving all of the liquid. Add the water, give a good stir, and place in the refrigerator to chill, or pour immediately over ice. Now, let me state how delicious this drink is. It is sweet, but not too sweet, creamy, and the flavors of cinnamon and vanilla are spot on. If you have never had horchata, go for it. It’s a drink of pure joy. This looks yummy! Reminds me of a drink in Colombia called Avena made with oatmeal! It depends on how big the glasses are. Maybe four or more pint size cups? you think you can use the strained rice for rice Pudding? i hate the thought of wasting it.. I have never tried, but give it a shot. Good luck. I always thought it was done with the water of a semi cooked rice. I guess I was wrong or is that another option?